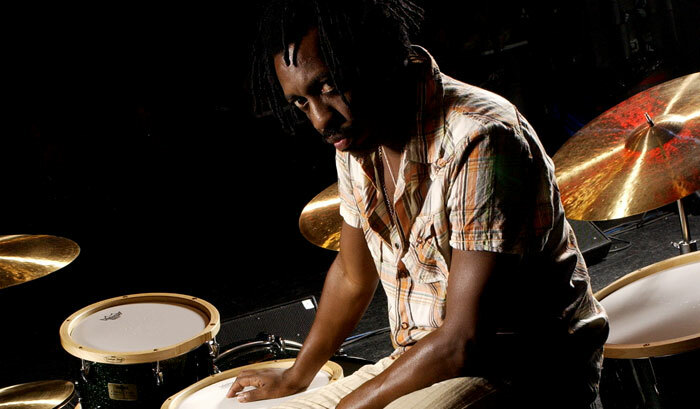 As one of the world's most respected drummers, Steve Jordan has played with a galaxy of stars since his debut as a teen prodigy in late-'70s New York. His credits include Aretha Franklin, Bruce Springsteen, Alicia Keys, Sonny Rollins, John Mayer, Neil Young, the Blues Brothers and countless others. He's also a producer, having worked with such artists as John Scofield, Keith Richards, Robert Cray and Buddy Guy. Steve spoke with us recently about his history, current projects and unique eco-friendly Yamaha drums. Tell us how you first became involved in music. I had some amazing teachers, like Mr. Ted Brown, Mr. John Barr, Mr. Justin DiCioccio and Mr. Joey Cal. I went to the Fiorello H. LaGuardia High School of Music and Art in New York. We had an after-school clinic/music program open to students from all over the city called Jazz Interactions, where they recruited great jazz musicians to teach kids. I hooked up with the late, great Freddie Waits, who played with Ella Fitzgerald and McCoy Tyner, and Motown tunes like Martha and the Vandellas' "Dancing In the Street," and "Fingertips" by Little Stevie Wonder. Freddie became my mentor and showed me what I needed to do to be a professional. Yamaha looks at what makes vintage drums special, then carries that craftsmanship into their modern drum making. How did you break into recording? When I started doing sessions, I wasn't even on the B-list--maybe the C-list. The A-list was people like Steve Gadd, Rick Marotta, and Chris Parker. In 1977, there was this massive snowstorm in New York. And all these guys lived in Woodstock or Rochester, so they couldn't get into town. But I lived in Chelsea, so I got calls for the sessions that they couldn't make! I played on a lot of records within two or three weeks' time and after that I began to work a lot. I was definitely in the right place at the right time. You became the drummer for the Saturday Night Live band when you were just 18. How did that come about? I played a gig with [guitarist] John Tropea that featured two drummers: Steve Gadd and myself. I was so nervous during the rehearsals that I couldn't even play. I remember setting up at the Bottom Line--the place was packed, and people were murmuring, "Who's that?" At any rate, the adrenalin kicked in and I played really well. It was a phenomenal evening. And that was how I landed the Saturday Night Live gig. You've played Yamaha drums for more than 25 years. What makes them special? I'm a big fan of vintage gear. And Yamaha is the only modern drum-maker with any sense of what makes vintage drums special. Yamaha looks at what makes great old drums, then carries that craftsmanship into their modern drum making. I have no problem putting Yamaha drums up with any of my favorite vintage drums. I just have a wonderful relationship with these drums. 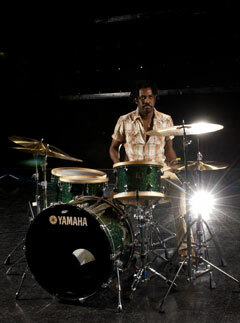 You've also worked with Yamaha to develop environmentally-friendly drums. I was trying to get Yamaha to make a kit with SmartWood, which is certified to improve forest management, but the wood was just too expensive. But they did make me the set I used with Sheryl Crow at the 2002 GRAMMYS. On a larger scale, my signature Yamaha snare is an environmentally sound drum: it uses nonpoisonous glue and ink, for example. You helped develop a cocktail kit for Yamaha. How does it differ from similar vintage kits? The cocktail drum kit was used in the '40s and '50s. Back then, if you didn't have a cabaret license, you couldn't have a set of drums onstage--but you could have a cocktail kit, to give a comedian some rim shots, to play behind the cabaret singer, that kind of thing. Very rarely does a vintage cocktail kit have all the pieces. The mechanisms at the time, like the kick drum pedal, were kind of shoddy. So in my cocktail kit, the hardware works--that's number one. And I made it with longer legs, so you can adjust the height. I added a little snare and a tom-tom, and there's a slab of wood clipped onto the side that you can play a rhythm on. That was David Garibaldi's idea. You can also clip on a cymbal, a cowbell or a hi-hat. Of all the amazing records you've worked on, which are your favorites? Besides my own band, The Verbs, which is me and my way-better half Meegan Voss, a lot of it is music I've also produced. That's why I became a producer--to affect the outcome of the records. Sometimes you'd work really hard in a session, but when the record came out, it didn't resemble anything you'd put into it. So I thought, well, somebody got paid to ruin it from point A to point Z. I could do that! I've had a great time producing artists like Soul Asylum and Keith Richards. The new John Scofield album, the new Buddy Guy album. I'm starting a new Patty Scialfa record, and I'll be producing an Isaac Hayes record and John Mayer's new album. I'm also going into the studio to record with Sonny Rollins. I'm really, really fortunate to be working with a lot of great musicians. I'm doing some other projects as well. I was the musical director and producer of the film Lightning in a Bottle. That was an incredible project to work on, chronicling the history of the blues. And I was the musical director of the 2004 Democratic National Convention. It was a great band--and afterwards, the Republican convention did the same exact thing we did! I'm also the musical director of the 2006 Super Bowl--Stevie Wonder will be the pre-game artist and the Rolling Stones will be the half-time artist. Even though you've been doing this for years, you still seem genuinely excited by the projects you're involved in. It's a very exciting time in music. The record business as we know it is over. We have to find new ways to get the music out there. You can't just have some A&R guy saying, "You've got too many kinds of music on this record--we can't figure out how to sell it." Those days are over, thank God! If they can't categorize you, you're probably doing something right. Make the kind of music you want to make--you can do anything you want, so long as you love it.